If it weren't for a love of history, Ira Colby, Ph.D. (M.S.W. '75), an internationally known social work educator, might have found his career taking a different path. When his supervisor at the Worcester, Massachusetts, YMCA suggested he pursue an advanced degree, Colby and his wife, Deborah (M.S.W. '80), made the trip to Virginia. "I was enamored with the South, and I love history. I'm intrigued with how we got to where we are today as a society," Ira said. "I read about Virginia Commonwealth University's rich history and thought the school must be doing something right." The Colbys both pursued graduate studies in social work at VCU and the experience proved invaluable to their careers. In appreciation of their time at VCU, the couple made provisions in their will to provide financial support for the VCU School of Social Work. The Deborah and Ira Colby Fund will create endowed scholarships for a graduate student pursuing a career working with children and families in the public sector and a Ph.D. student pursuing a career in higher education with a specialization in social welfare policy. "Faculty members at VCU were amazing individuals," Ira said. "They pushed and prodded and encouraged you to think differently. It was a vibrant place for students, and it gave me a chance to think about who I wanted to be and the best way for me to get there." 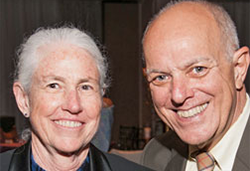 The couple's generous planned gift is a percentage of their estate, which at the time was the largest individual commitment in the school's history. "Ira and Deborah both developed a sense of and a passion for social work education when they were here at VCU," said James E. Hinterlong, Ph.D., then-dean of the VCU School of Social Work. "Their generous gift reflects their commitment to the future of the profession and to VCU." The Colbys are grateful for the foundation that VCU provided. "We both recognize that VCU was very important to our professional lives," Ira said. "If it weren't for VCU having a program in social work education, I know I wouldn't be here today."